Why is it snowing at the end of March?? Oh well, more time to stay in and test. We picked up some items from CVS and Walgreens to prepare for spring. The Walgreens version of Neutrogena Night Calming Wipes were a major letdown, while the generics for Visine and Banana Boat were decent. See what we're packing. Brandefy compares off brands (e.g., Well at Walgreens) to name brands (e.g., Banana Boat) to show you when the generic is as good as the name brand, and to warn you when it is not. Our purpose is to help you save time and money, and to have a good time while doing it. Let's start with a real winner. We are big fans of Visine to keep our eyes nice and white. It's like makeup for the eyes when the spring pollen starts making us look like a beloved relative died. Not only do we want to be happy, we want to look happy. 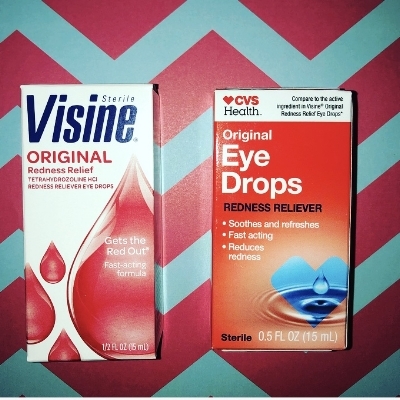 CVSHealth does a nice job mimicking Visine Original eye drops. We gave these drops an overall similarity score of 92%. The ingredient panels are 96% similar. Neither has a smell and they are both gentle and effective on the eye. The main difference for us was the packaging, but the CVS bottle was actually easier to open. We will be making the switch to save $1.50. Two thumbs up for this generic. The next item was not quite as similar to its name brand counterpart, but we did like certain aspects of it. We wanted an easy to travel with and easy to apply sunscreen for our upcoming trip to an amusement park (more on that to come!). We picked up the Well at Walgreens Sport Stick sunscreen with SPF 55. We liked that this came in a two pack of retractable sticks reminiscent of a chapstick container. The Banana Boat sport stick is labeled as SPF 50+ and comes in a container similar to a deodorant dispenser. We gave these sunscreens an overall similarity score of 68%. The active ingredients are very similar, with the Walgreens version being more concentrated. The inactive ingredients are not similar at all. We found both to be effective, and they both absorbed into our skin quickly. We greatly preferred how smoothly the Banana Boat sunscreen went on. It is very smooth, while the Beeswax in the Walgreens sunscreen makes it a little gritty. Neither sunscreen has a strong smell, which is nice. A big bummer at 57% similar is Walgreen's Studio 35 Beauty Night Calming Wipes. These are a copy of the Neutrogena wipes. We love the Neutrogena wipes because they are a luxurious way to remove makeup before bed. The Walgreens wipes do not smell much of lavender, or anything floral for that matter. They did feel more moist and did a nice job removing our makeup. That being said, we were disappointed by the ingredient panels. Ingredient panels are only 30% similar, and the generic has an additional 12 ingredients. We are anti extra ingredients if they are not adding to the overall effectiveness. These are not worth the switch for such a small price difference. Why all the extra stuff, Walgreens?? ?